Axon Enterprise wants investors to think it's a SaaS company, but it doesn't look like one. Axon Enterprise (NASDAQ:AAXN) is going through a major transition as a company, doubling down on a subscription-based model for Tasers and body cameras. Subscriptions often include software services like storage on Evidence.com or new services like Axon records, a record-keeping application in the cloud. As a result, management is trying to position Axon to investors as a software company instead of the hardware company it's always been. It's easy to see the motivation. Software companies are usually valued more highly than hardware companies on both a revenue and earnings multiple bases, something that hardware companies are envious of. Higher stock values are great, but in Axon's case, its CEO has a compensation package that is almost entirely stock-based and ties share awards to a higher market cap, so there are major management incentives to get a higher valuation. As much as I like Axon's business and its stock, it's important for investors to fully understand what management is doing to position the company as a software-as-a-service (SaaS) business -- while still being able to spot the shortcomings of its approach. It's not easy to transition from a hardware company to a SaaS software plus hardware solutions company. And we are incredibly excited to be making this happen. And as CEO, I just want to thank our shareholders for responding well, and thanks to all of you who've been so supportive of this transition over the years. And I've allocated the capital that will allow us to continue to execute and return value back to you. One of the big accomplishments in the quarter was our follow-on offering, which we consider a reIPO. The offering was highly beneficial on a couple of key fronts. First, it provided us with significant resources to be able to accelerate our shift across the entire business toward subscription. And we've begun executing on the internal functions now to support that so we can move the TASER business even more aggressively to subscription. Trying to reposition as a SaaS company makes sense for a business trying to get a higher valuation for a stock. But Axon may not have the critical qualities needed to be a SaaS company. SaaS companies are able to leverage the fixed cost of developing their software, and sell it over and over again as a service to multiple customers. Take an enterprise planning company like Oracle, which spends billions to develop software that large companies use to run their businesses. The up-front costs are huge, but each customer added carries an incredibly high margin because there's little incremental cost involved. The core value generation for a business such as this is getting more people to use the software. If the business model works well, companies will generate high gross margins over the long term. 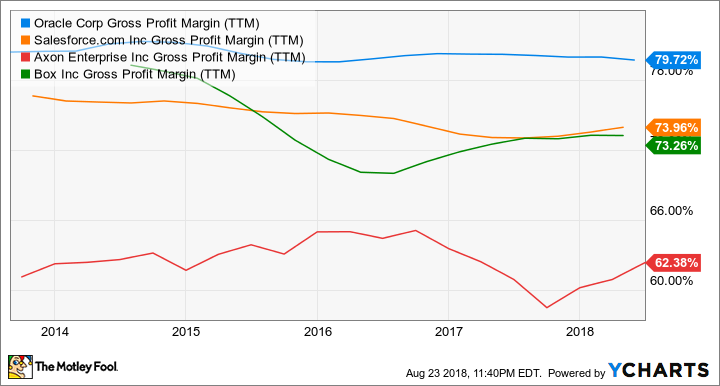 Oracle, Salesforce, and Box Inc. are three great examples of SaaS companies, and you can see that they all generate high gross margins as a result of the dynamic outlined above, especially compared to Axon. ORCL Gross Profit Margin (TTM) data by YCharts. Why isn't Axon a SaaS company like Oracle, Salesforce, and Box? In a nutshell, because growth for Axon is driven by more people using its hardware. Sure, software is a big moneymaker, but if no one is using its hardware, then the software is useless. The scale of hardware sales to software sales at Axon is quite telling. In the first six months of 2018, Axon generated $157.7 million in sales from hardware and $42.7 million of sales from software. Keep in mind that $124.1 million of hardware sales came from Tasers, which have no SaaS component at all. Axon may want investors to think of it as a SaaS company, but it's really a hardware company moving to a subscription-business model. Another issue I take with Axon's pitch to be a SaaS company is that Axon relies on the services of other SaaS companies. It used Amazon's AWS service to build Evidence.com, and recently transitioned to Microsoft's Azure cloud service for Evidence.com and new products like Axon Records. These partners are really the ones offering software as a service; Axon is just repackaging those services as an add-on for a hardware subscription. Companies sometimes go through these phases where they try to position themselves to investors to get the highest valuation. A few years ago the Internet of Things and the cloud were in vogue. Now that SaaS is the hot business model on Wall Street, Axon wants to be seen as a SaaS company. None of this is to say that Axon doesn't have a great business. But I believe it should focus on its strengths and not on positioning with investors. Stock value will be a result of long-term business success, not the market's buy-in of a SaaS positioning.